“A craft product that is also a work of art.” This idea came to me two years ago. There are many superior forms of craft in Japan that are practiced by hand. The value of those who have mastered such crafts is not what it once was, having been hurt by the lack of successors caused by growing reliance on industrialized production. Brands, however, increasingly use the word “craftsmanship” to describe the attention to detail and aesthetic beauty of the products they create. 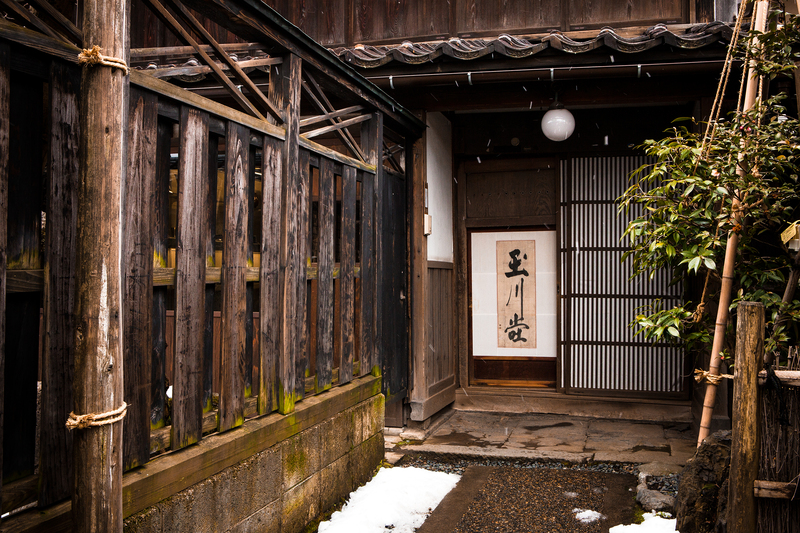 The world has, in particular, become enamored with Japanese master craftsmanship as exemplified by Gyokusendo—the tsuiki copperware workshop that has been in remote Tsubame-Sanjo, Niigata Prefecture, for 200 years. Through my collaboration with Gyokusendo, we have created a work of art that offers an entirely new perspective: MOON. Tsuiki at heart, but refashioned with various casting and polishing techniques, MOON is a container the likes of which has never been seen before. There are many elements of nature admired around the world—mountains, rivers, oceans—but their location defines their appearance and the way they are appreciated and understood. The moon, however, looks the same from every part of the world. When we think of the universe—an immense expanse that belongs to no one country or culture—the moon always comes to us as a familiar, kindly presence. MOON has been designed around the stages of the moon—full, half, and crescent. It is a limited edition product with only 100 units available. I invite you to gaze upon your own personal moon, produced by Japanese craftsmanship, and place your most cherished treasure within its embrace. Tanigawa was born in 1965. In 2002, he founded consulting firm JTQ Inc., which provides creative direction to clients who want to “deliver their messages through the medium of space.” Tanigawa does not simply design physical structures; he applies all forms of communication to brand development and promotion. 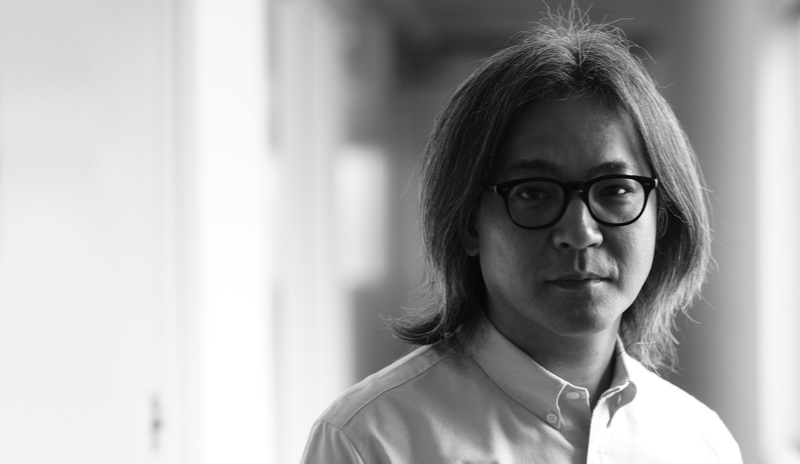 His major works include the Kansei Exhibition (2009) at the Palais du Louvre’s Museum of Decorative Arts, the Yakushiji Hikari Emaki (2010) to commemorate the 1300th anniversary of Heijyokyo, the Good Design Exhibitions (2007-2012), KRUG Bottle Cooler (2011, 2013), MEDIA AMBITION TOKYO (2013 – 2014) and IMA CONCEPT STORE (2014). Tanigawa has been selected for the D&AD Awards, as well as winning numerous DSA (formerly DDA) Awards for his outstanding contributions to spatial design. Tanigawa serves as executive producer of this series of products created through collaborations between companies and traditional craft workshops. 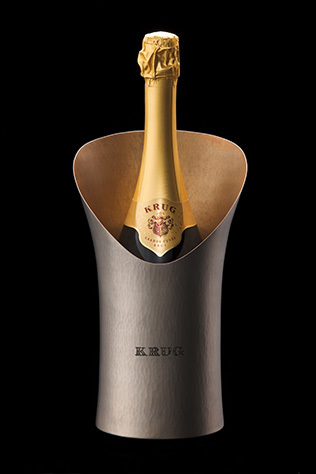 The series launched with a tsuiki copper bottle cooler created by champagne house KRUG and Gyokusendo. It was followed by a bottle cooler crafted from bamboo and cast metal—again involving KRUG and, this time, Kyoto bamboo workshop Takemata and Takaoka metal workshop Nousaku. 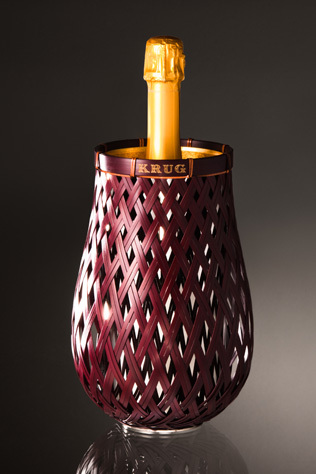 Each product is a unique work of art that combines contemporary aesthetics with traditional crafts refined by several generations of master artisans. The kanji used to write the word “life” (命) is made up of other kanji: “person” (人), “one” (一), and “strike” (叩). Motoyuki Tamagawa, the seventh-generation head of Gyokusendo, believes that “life” arises when a “person” “strikes” a “single” sheet of copper. His company’s history can be traced back to 1816, when its founder, who had inherited the tsuiki copperware technique that had spread to Niigata's Tsubame-Sanjo region in the late Edo Period, played a key role in the dawn of the industry. At first, Gyokusendo produced copperware to serve daily needs, but gradually the company expanded into handicrafts. In addition to appearing at world expositions like the Weltausstellung in Vienna (Japan’s first showing, in 1873) and the Japan-British Exhibition (1910), Gyokusendo’s work has also been presented to Japan’s Imperial Household. Today, the company has been named an Intangible Cultural Property by both Niigata Prefecture and Japan’s Agency for Cultural Affairs, and continues its efforts to expand as the country’s sole source of tsuiki copperware. 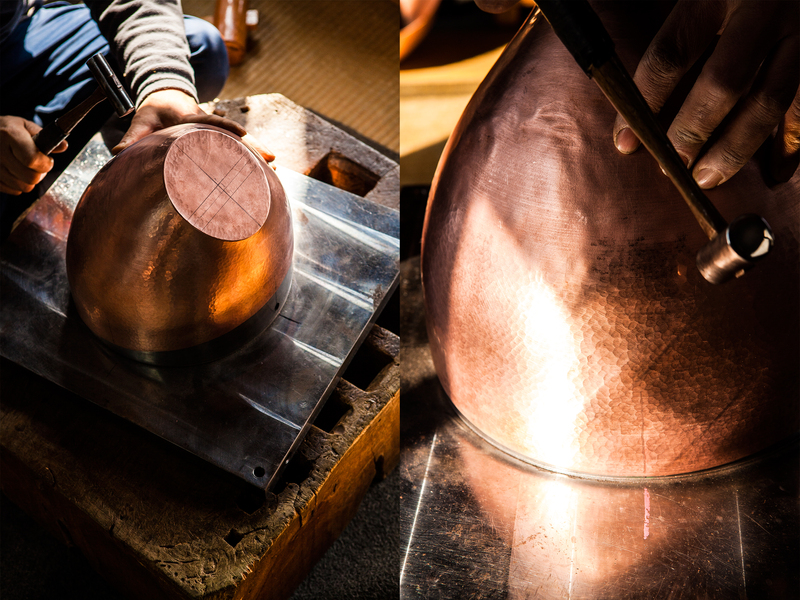 Tsuiki is the name given to the traditional technique of taking a single sheet of copper and striking it with wooden and metal hammers, great and small, to shrink it until it takes shape as a vessel. Copper hardens when it is struck and creased, so it must be repeatedly heated and cooled to restore its flexibility as it is hammered smaller. Once the sheet of copper has been transformed into a three-dimensional shape, it is soaked in natural liquids like potassium sulfide to oxidize the surface and give it its patina. This sturdy and stunning texture is the hallmark of tsuiki copperware, and even within Japan, its patterns are unique to the Tsubame-Sanjo region.